Once again we’re back with Carol Hatcher whose blog is titled Sheep to the Right. Yet in that despair came a glimmer of hope. He’d heard stories of the one they called Teacher. He’d never seen any of the miracles, but there was talk of him healing the sick and even raising the dead. The Bible states it simply. Christ didn’t ask questions. He didn’t give instructions for the disciples to pass out tracts while he ran on his miracle errand. He just went. Jairus must have been thrilled. I imagine him trying to move briskly in the direction of his home suppressing the urge to break into a sprint. But there were all those people. I would have run, shoving men and women as I went. Shove now, apologize later. There was a life at stake after all. Then this woman showed up – hoping for a miracle of her own. The embarrassment over her “unclean” condition was perhaps what motivated her to touch Jesus in secret. She probably thought, I’ll keep my head covered and just touch his clothes. He is so powerful, even the fibers woven to adorn his body will be enough. No doubt, she intended on slipping out of the crowd as soon as she was healed, but Jesus was aware of her presence. “Who touched me?” Christ asked, wanting to look upon the face of the woman with such faith. Let’s freeze that moment and talk a minute about those around Jesus and what they were thinking. We know the disciples were thinking their Lord was loco (crazy). The Bible doesn’t tell us their tone, but one can only imagine. After Jesus’ question, their response was, “You see people crowding against you, and yet you can ask, ‘Who touched me?’” (v. 31) I can almost see the sarcasm dripping from the words. Back to the situation at hand. Can you imagine the agony? He succeeded in getting Jesus to come only to have his daughter die before they could arrive. Once again, the Bible is silent on Jairus’ response, but we can infer from Jesus’ next words that Jairus was upset. How many times have you heard the worst? Perhaps the doctors have given no hope. Maybe your family laughed when you shared your dream. You thought you heard the voice of God, but now you are not so sure. Take Jesus’ advice – ignore what they said. Then don’t be afraid. Just believe. Sometimes in order to achieve the impossible, we have to disregard the obstacles. When God is in it, all things are possible. So today I ask what impossible task are you facing? Perhaps you need to ignore the discouraging words and the laughs. Then don’t be afraid. Just believe. In our quest to feature writers from different branches of Christianity, today we are paying a return visit to the blog Power Up! which is part of the Charisma Magazine website. This particular blog is updated weekly and features different Charismatic writers. To read this at source, explore other articles on the blog, and then migrate to one of ten other blogs on the site, click the title below; for more info on the writer, click her name below the title or the links at the bottom of today’s article. Jill told me that she had experienced similar healings in the past, so her faith was built up in the area of physical healing. I asked her about the problem she was having with receiving inward, emotional healing. Before she could respond, the Holy Spirit began to show me what the problem was. “You receive the inner healing when you pray, don’t you?” I asked. “But then negative thoughts come and you start to dwell on them, right?” Jill thought for a few minutes and agreed that this was what happened whenever she was hurt emotionally. Jill’s difficulty is a widespread one in the body of Christ today. Many of us have had physical or emotional healings or even visions and words from the Lord that we received and believed at the time. Then after a while negative thoughts began to come and fight against the healing or vision. As we entertained the thoughts, they got a stronger hold, and then we became double-minded. 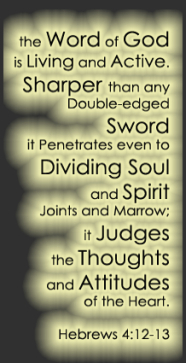 The apostle James tells us that a person who is double-minded is “unstable in ALL his ways” (James 1:8, emphasis added). He also says that we are to “Ask in faith, with no doubting, for he who doubts is like a wave of the sea driven and tossed by the wind” (v. 6) and is unlikely to “receive anything from the Lord” (v.7). No wonder the devil wants us to entertain negative thoughts that war against our faith! No wonder we are told to bring “every thought into captivity to the obedience of Christ” (2 Cor. 10:5)! Thoughts can be very positive and build our faith, or they can become the means of aborting our vision. The devil doesn’t want us to prove God and fulfill our destiny, so he continually throws thoughts into our minds like arrows. If we are not on guard against them, the arrows will enter and bring unbelief, doubt, fear and even depression and defeat. Remember, God is not a yes and no God! 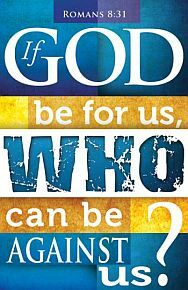 The Bible says that “ALL the promises of God in [Christ Jesus] are YES, and in Him, AMEN, to the glory of God through us” (2 Cor. 1:20, emphasis added). 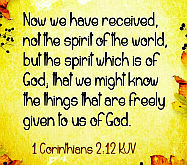 Paul is saying there is a preparation we need to make concerning our minds. In the book of Ephesians he tells is what it is: putting on the pieces of armor, particularly the helmet of salvation, that are given to us to equip us for battle. What is the helmet for? It covers the mind. Sometimes we get so busy wielding the sword that we forget to put on our helmets and “gird up the loins of our minds.” Then Satan has a field day. Remember, his ministry is the same today as it was in the beginning—to plant doubt in the in mind of God’s people by asking, “Has God indeed said?” (Gen. 3:1). When God gives you a word or a vision, or gives you direction for your life and calling, you receive it and are excited. But then Satan, that sly, old fox, sends all his little foxes out to capture your thoughts, generally before you’ve had the opportunity to lay hold of your vision. Just as in the natural foxes come to steal the farmers’ chickens, in the spiritual realm Satan’s cohorts come to steal God’s word out of your heart and mind by causing you to doubt. Many of God’s children have almost given up their “word” or the vision that God imparted because of these destructive little foxes that come in the guise of negative thoughts. The negative thoughts are particularly destructive when they play on past disappointment. If if the enemy can get us to dwell on all the times when we didn’t receive what we hoped or believed for, he will lead us into certain defeat. Don’t allow past disappointments to affect your present faith! Instead, look to Jesus, the “author and finisher of [your] faith” (Heb. 12:2). God wants us to walk in faith to receive the things we need to do His work. We must be filled with the Spirit and with faith in order to bring healing and deliverance and dwell in the wisdom of God, not just for our own lives but for others’ also. So put on your helmet of salvation, and when you see those foxes advancing, send them packing by taking every thought captive and trusting Jesus to increase your faith. As you pray this week, remember God’s Word and believe what He has promised on your behalf (2 Cor.1:20). Claim the Scriptures for the salvation of your loved ones, the furtherance of the gospel, and the establishment of His kingdom on earth. Continue to pray for worldwide revival, and especially for our own nation. Remember our government and spiritual leaders and ask the Lord to give them wisdom, grace and protection (1 Tim. 2:1-3; 2 Cor. 1:20; 2 Cor. 10:5). 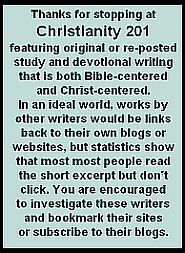 Articles here are often a mixture of in-depth Bible study and personal devotions. Sometimes I think we don’t do enough of the latter. Today, we’re again returning to Proverbs 31 Ministries. This time it’s a different writer, Leah DiPascal. Click the title below to read this on their site. I would’ve loved to see Jesus miraculously heal that precious woman in the synagogue on that Sabbath day. It’s beautiful how her very first response was to praise God. How do you express gratitude for all God has done in your life? What are some things you can praise Him for today? Could This Be Another Reason The Samaritan Returned to Give Thanks? Today we return to the blog, Into the Foolishness of God by Shara Case. Click the title to read at source, and take a few minutes to look around other recent articles there as well. I was really struck by an insight on a most familiar story as I looked at this. I hope you see also why I chose this reading for our consideration. Ten outcasts, healed and made well. They cried out for help and Jesus was quick to heal them. His compassion and mercy extended to each one in the same way. They were healed “as they went” to the temple. It must have been astounding – the word “cleansed” implies that they were made clean, emptied of any trace of disease inside. As they walked away, they were healed. Nine of these men were Jews, and in order to reenter society, the law said they must go see a priest to verify that they were in good health. They became first-hand witnesses, as did the priests, to the power and truth of who Jesus really was. Imagine the conflict this posed for the Jews and the priests alike – people who lived according to Old Testament law, who rejected everything Jesus did and who He was. Their ‘laws’ were falling apart right before their eyes, but Jesus sent them anyway. He sent them off to be a testimony to His power. But one of these men couldn’t go to the temple. One of these men was a Samaritan, and the only thing that bound them all together was their disease, for “Jews and Samaritans had no dealings with one another” (John 4:9). He was an outcast among outcasts. While the nine headed for their temple to fulfill the law requirements, this foreigner turned back. The text implies that he was walking away, and when he realized he had been healed, he turned back “with a loud voice” and glorified God. How could he not?! What an amazing miracle to witness! While the Jews were focused on what they had to do at the temple, this Samaritan turned his focus to the living temple. I’m sure the other nine were grateful and thankful and amazed, but they were heading in the wrong direction. In their eyes, God dwelt in the temple. They were Jews, God’s chosen people. They would connect with Him at the temple, in ceremonial fashion, and move on. But this Samaritan… he was wrecked. The magnitude of what just occurred had him face down in the dirt at Jesus’ feet. His gratefulness could be seen and felt. Imagine the story he would tell his family and friends whom he hadn’t seen in probably some time. Imagine him returning to his life, a new and healed man. He had no temple to go to, but in the end he had the one true Temple, Jesus Himself. The Jews were heading to a lifeless building and they had no interest in anything else. They received their healing, but they weren’t made whole the way the Samaritan man was. When Jesus tells him “your faith has made you well” He wasn’t talking about a physical healing, he was using the word for saved. This outcast received a second miracle. He knew he was face-to-face with the living God. He was healed in body and in spirit. God’s goodness is extended to us all, He has compassion on all He has made (Psalm 145:9). He calls us to Himself through things like this, and if we just turn and walk away, we miss the true miracle. We are content to take what He gives and keep on going. To be made truly whole though, we need to stop and turn around and see Him for who He is, not just what He does for us. The Jews had no desire to press in any deeper after they received what they wanted. When nine people walk away, be the one who remains with Him. He resides with us now, no longer confined to a temple. Be the one who turns around and receives the better, lasting gift. He is eager to heal and meet our needs, we should be just as eager to stay with Him after He does. What Do You Do With an Ex-Blind Man? Think about being born blind; having no visual reference for anything other than your imagination; and then suddenly you can see! We had some shorter readings on the weekend, but today we jump back in with full force! We’re paying a return visit to Rick Morgan, who blogs in the UK at Digging The Word. Click the title below to read at source. John 9:5-11 “While I am here in the world, I am the light of the world.” 6 Then He spit on the ground, made mud with the saliva, and spread the mud over the blind man’s eyes. 7 He told him, “Go wash yourself in the pool of Siloam” (Siloam means “sent”). God sent light into our world because we desperately needed it, we had the sun for physical sight on this planet but we were still in the dark spiritually. Just like this blind man, we had sunshine all around us but we couldn’t see it, we need Jesus help to give us spiritual light. This man had no hope of seeing the light, nobody ever healed a man that was born blind, and he didn’t have any reason to believe that his situation was going to change. He lived everyday knowing that he would never see, he would always be a beggar, and he would always be stuck depending on others. This man never knew the light of the sun so he couldn’t know that the light of the world was on the way. He may have been physically blind but there must have been some amount of spiritual light that gave him the faith to follow Jesus instructions. He didn’t have to obey and go to the pool, what if his faith in Jesus wasn’t any better than the Pharisees? Now what do you do with Jesus? The religious leaders are really in a bad way. There are too many witnesses to the fact that this man has been blind all of his life but now he can see. The fact that he is healed seems to be undeniable, at first they try and say he isn’t the same man but that opinion was quickly shot down and now they need a new story. What can we do with Jesus? He isn’t the Messiah, the Messiah wouldn’t break the Sabbath, he wouldn’t tell us Pharisees how bad we are, but how can we deny his power? Maybe we can say that his power is from Satan. As God’s number one creation, man will go to great lengths and create outrageous stories to deny God’s glory. We will explain away what is so easy to accept when you aren’t spiritually blind. The simple logical reasoning of this guy couldn’t be denied, he broke it down and made it plain, there wasn’t any other explanation for the facts. No pressure from the Pharisees would make him change his mind, not after what he has just experienced, so they verbally attack him and expelled him from the synagogue. John 9:38 “Yes, Lord, I believe!” the man said. And he worshiped Jesus. Jesus never left people wondering, he found the man and helped him understand, if they had mustard seed sized faith then he was going to water it and help it increase. There are a lot of different responses to Jesus but this man gets it right and responds in worship, he even does it right there in front of the Pharisees, he doesn’t care what anybody thinks or what the consequences will be. Out of all of the people that were a part of this story there was only one that was worshiping. 2 Corinthians 4:4,6 Satan, who is the god of this world, has blinded the minds of those who don’t believe. They are unable to see the glorious light of the Good News. They don’t understand this message about the glory of Christ, who is the exact likeness of God. For God, who said, “Let there be light in the darkness,” has made this light shine in our hearts so we could know the glory of God that is seen in the face of Jesus Christ. The “giver of darkness” has been defeated by the “giver of light.” God said “Let there be light” and shortly after that Satan brought us back to the dark but that dark has been defeated by the Light of the World. John 10:24-27 The people surrounded Him and asked, “How long are You going to keep us in suspense? If You are the Messiah, tell us plainly.” 25 Jesus replied, “I have already told you, and you don’t believe Me. The proof is the work I do in My Father’s name. 26 But you don’t believe Me because you are not My sheep. 27 My sheep listen to My voice; I know them, and they follow Me. I was amazed when I did a search on Google for “giver of light.” A lot of the search results had nothing to do with Jesus or the gospel, Satan knows that we want to live in the light so he has developed a lot of counterfeit sources of light. Matthew 5:14 “You are the light of the world—like a city on a hilltop that cannot be hidden. The Light of the World has left us here on this dark planet with a job to do, since Jesus our Savior has opened our blind eyes for God’s glory, we should work to point others to Him. Now it is our turn to be the giver of light, sure we are small candles compared to the true light of the world but as a community of believers we can shine very bright as we live for him and love like he did. Help me to be a light house for you in this dark world. Amen. The Gospel of Christ’s grace deals thoroughly both with the sins we have committed and with the evils we have suffered. Somewhere along the way, some of us may have gained the mistaken notion that to address suffering means minimizing sin and capitulating to a secular psychology perspective on victimization. While I understand that concern, biblically it is unwarranted. In fact, biblical counseling that deals only with the sins we have committed is half-biblical counseling. This means that it is also “half-gospel-centered” counseling. Unlike the Bible, we sometimes tend to make Christ’s victory over sin predominantly individual and personal, rather than also corporate and cosmic. Christ died to dethrone sin and defeat every vestige of sin. Christ died to obliterate every effect of sin — individual, personal, corporate, and cosmic — including death and suffering, tears and sorrows, mourning, crying, and pain. Question 52 in the New City Catechism asks, “What hope does everlasting life hold for us?” John in Revelation answers, “All our greatest sorrows will be swallowed up!” Christ died to defeat every enemy, every evil, including the Devil, who holds the power of death (Hebrews 2:14-15), and the last enemy — suffering and death (1 Corinthians 15:25; Isaiah 53:4). Certainly the Gospel is about payment for and forgiveness of personal sin. Equally certain is the Gospel’s eternal overthrow of the curse of sin — including suffering. That overthrow has already begun! Christ invites us to share with one another his healing hope in the midst of suffering today. It is only through the hope of the Gospel that we can truly face suffering and find hope in suffering. Kevin Vanhoozer, in pondering the drama of redemption, explains that tragedies deal with catastrophes. The Gospel, while never denying the catastrophe of sin, deals with what he calls eucatastrophe — Christ has accomplished something extraordinarily amazing out of something horribly evil. This insight helps us to develop a biblical sufferology — a Gospel-centered theology of suffering. We’ll see that the Gospel way to address suffering follows the twin paths of brutal honesty — it’s normal to hurt; and radical reliance — it is possible to hope. Olaudah Equiano, a Christian and an enslaved African American, began his life story with these words, “I acknowledge the mercies of Providence in every occurrence of my life.” His words might sound trite until we realize that they introduce the narrative of his harrowing kidnapping and enslavement. Equiano was born a free man in 1745 in the kingdom of Benin on the coast of Africa. The youngest of seven children, his loving parents gave him the name Olaudah, signifying favored one. Indeed, he lived a favored life in his idyllic upbringing in a simple and quiet village, where his father served as the “chief man” who decided disputes, and where his mother adored him. One day, when all our people were gone out to their works as usual, and only I and my dear sister were left to mind the house, two men and a woman got over our walls, and in a moment seized us both; and, without giving us time to cry out, or make resistance, they stopped our mouths, tied our hands, and ran off with us into the nearest woods: and continued to carry us as far as they could, till night came on, when we reached a small house, where the robbers halted for refreshment, and spent the night. The next day proved a day of greater sorrow than I had yet experienced; for my sister and I were then separated, while we lay clasped in each other’s arms; it was in vain that we besought them not to part us: she was torn from me, and immediately carried away, while I was left in a state of distraction not to be described. I cried and grieved continually; and for several days did not eat anything but what they forced into my mouth. It was during these evil circumstances, and many more to come, that Equiano acknowledged his heavenly Father’s good heart and Christ’s merciful providence in every occurrence of his life. In his autobiography he makes the sweeping affirmation that even in the face of human evil, God is friendly and benevolent, able and willing to turn into good ends whatever may occur. Paul, inspired by God, tells us that’s a lie. In fact, he shows us that when we deny our hurt, we deny our need for God. And he demonstrates that the pathway to hope often straddles the precipice of despair. Moving beyond the suffering first requires moving into the suffering. Sarnia pastor Kevin Rogers’ material at The Orphan Age has been featured here since Christianity 201’s inception. Today, we’re ‘borrowing’ from three different blog posts on the story of Jesus healing the ten lepers. To read the original posts, click here, here and here. Today the world is dealing with the crisis of the Ebola disease. This is likely the largest outbreak in history for this particular disease. If an epidemic affects a whole country or spreads over the world, it is called a pandemic. Ebola is not yet a pandemic, but the potential does exist. While it is necessary to take wise precautions in areas affected and those who deal with patients, we need to understand a historical perspective on diseases. While this is just a small list of killer diseases in history, we can see that human history has been unable to eradicate sicknesses that kill. Every generation has had its theories and science to try and prevent the spread. In many cases, we are able to protect and prevent. But, new ones appear in time. The history of civilization is also a history of disease. Every generation lives with the fear of death from unseen biological enemies. We are able to eliminate some diseases, but we are not able to eliminate the fear of death. There have always been diseases and conditions that become the defining feature of a person’s existence. No longer a man or woman, you have become something else—a leper. What other ways have we taken symptoms and characteristics and used them to define people as something less than what we are? Jesus often travels along borders of human division. If you want to see where Jesus is at work, look for human borders that separate people from one another. The separation between Samaria and Galilee was marked by a huge gulf in understanding and respect. The ten men on the outskirts of town were all given the same name—Leper. Any other defining characteristic was lost or losing ground. It may be that 9 of them were Jewish and 1 was Samaritan. The religious distinctions were buried by the disease identity. Their names, family connections and occupations were quickly becoming memories. In suffering, they become each others companions. Former distinctions were less important to them now that they were truly alone. There are some labels that supersede everything else that you are or were. Is it any wonder that they cry to Jesus for mercy? Who else was there to listen to them? The gatekeepers of society ensured that they were kept away in the name of public safety. In the absence of a healthy community connection, the exiles formed community among the sick. Sometimes the sick take care of the sick, better than the healthy do. Other times, they lack the strength and resource to make any difference for their companions and misery is met with misery. A year ago we introduced you to Chris Hendrix at the blog Devotions By Chris. We returned for a visit and found the piece included below, but we’ve also borrowed another resource from his blog, a list of ten healing scriptures, and as we consider the mountains people face, perhaps that’s the obstacle that you or someone close to you is facing. I also liked this particular devotional because it reminds me how much of my understanding of key scripture verses is shaped by the King James rendering I learned in my younger days, and how I now just speed by these verses because I think I know them. To read the two posts below at source, which you’re encouraged to do, just click the titles below. One of the songs we used to sing at church came from Zechariah 4:6-7. It went, “Not by might. Not by power, but by my spirit sayeth The Lord. This mountain shall be removed by my spirit sayeth The Lord.” I remember wondering what the deeper meaning of that scripture song was. As a child, I didn’t have the capacity to understand it, but I sang it with all of my heart. I had no idea those scripture songs would come back to life in my mind years later. As I read those verses recently, I started reading them in different translations. An angel was showing Zechariah things in the spirit realm. One of the things he saw was a lamp stand made of gold with a bowl for oil and seven lights with spouts down to the bowl of oil. There were two olive trees on either side of the lamp stand where the bowl was getting its oil from. Zechariah asked the angel what it meant. In the Message version, the angel replied, “You can’t force these things. They only come about through my Spirit. So, big mountain, who do you think you are? You’re nothing but a molehill.” In my own life, I’ve been known to force things to make them happen. I tell myself, “If things aren’t happening, make them happen.” I pride myself on my determination to get things done. If there’s a brick wall I can’t get over, I do what I can to knock it down. I don’t let it stand in my way. I’m learning that I can’t force things that God wants to do in His timing. In the Amplified translation, the angel replied, “Not by might, nor by power, but by my Spirit of whom the oil is a symbol, says The Lord of Hosts. For who are you, O great mountain of human obstacles? You shall become a plain. A mere molehill.” Here I see that we have to stay plugged in to God’s Spirit. The oil feeds the lamp and keeps it burning. The bowl was connected to the olive trees so it wouldn’t run out. Our connection to God gives us the strength to get past the obstacles in our lives created by ourselves or others. It’s not by anything we do, but only through Him that we will succeed. In the Good News Bible translation, the angel replied, “You will succeed, not by military might or by your own strength, but by my Spirit. Obstacles as great as mountains will disappear before you.” I like this one because when we face mountains in our lives, we wonder if we will ever get past them. Here, God reminds us that we will be successful and it won’t be dependent on anything we do. It’s through Him that we will be successful. When we realize that, the mountains in our lives will no longer look like mountains because of our perspective. A mountain is tiny in God’s eyes. Whatever mountain stands in your way today, know that you will be successful in getting past it, but it won’t be because of your own strength. It won’t be because you forced your way through it. You will succeed because you are tapped into God’s Spirit and recognize His strength in your life. When you give up your strength and tactics to accept His, you will see those obstacles in your way disappear and become mere molehills. Trust in God today and get into His Word so you have oil in your lamp to see what He is about to do for you. Part of that encouragement is to follow up and see where people are at a week or two later; I don’t think you should just drop your little kernels of truth and then take off. So I was a little disappointed to discover that one blogger who seemed to be wrestling with the question of inner healing had taken his blog offline. Some sins can be habitual or even addictive behaviors, but for the most part I think our sin is the result of our choice. I like your concept of exploring this with a parallel look at the subject of healing. We often speak of this as “inner healing,” or “healing of the mind.” Of course, we can’t expect God to rid of us all evil desires in the way he might rid of us disease, or the effects of injury. Instead, the Bible gives us another concept to consider: Holiness. While the righteousness of Christ is “imputed” to us at salvation; and while we are encouraged to pray “lead us not into temptation;” holiness is going to require a greater effort on our part. (2) Why do some Christians experience a dramatic before-versus-after cleansing, entering into more holy living; while others continue to grapple with sin? I think the answer to (1) is yes; God can intervene and take away desires, or send circumstances so that those desires diminish. The answer to (2) is more complex, though some elderly, “holy” people will admit they still struggle with wrong thoughts and desires. If I had it to write over again, I would have added this: Part of what transacted on the cross was that we were freed from sin having power over us. I no longer have to serve sin. Christ has freed us from the power of sin. Yet still, I may choose to sin. And one thing I’m learning is that the more I know of Christ and of Biblical teaching, the more that choice to sin is an informed choice. In other words, I am increasingly more responsible for my choices than a blogger in his teens or twenties who may be wrestling with parallel issues. So how would you answer the two above questions? Which is the bigger request, to ask God to heal someone’s thought life, desires or impulses; or ask God to heal someone of disease? Update: Feb. 2014 — While watching an episode of the children’s video series What’s in the Bible, I was reminded that God frees us from the stain of sin, the power of sin and the effects of the presence of sin in the world. Each of these is however, a different focus. It’s been awhile since we had a worship song here, and the post for tomorrow featuring a Paul Baloche song was written before this one. But while looking at Paul’s website, I found this article. Since many C201 readers are in ministry themselves, or offer ministry at times of need, I thought this might connect with some of you. Some of the hardest yet most inspiring times of worship occur during funerals. The raw emotions of sadness and loss are mixed with a sense of hope and eternal perspective. “It is better to go to a house of mourning than to go to a house of feasting, for death is the destiny of every man; the living should take this to heart” (7:2 NIV). In our fast-paced culture, funerals give us the rare occasion to reflect on the brevity of life and how each of our days are numbered. There is a sense of “coming to terms” with reality that our life on this earth will end. As Christians we find assurance in the promise of God’s Word that Jesus Christ did indeed die for the remission of our sins and rose again with the invitation to live forever through Him and with Him. Songs of worship can be the most encouraging aspect of a funeral service or a time of intense grief. Part of my role as a worship pastor is to show up and “pastor” those who are grieving. Several times last year I was called upon to lead worship during memorial or graveside services. Silence can be powerful. Stillness consoling. Yet when a simple chorus or hymn begins with a guitar or human voice, you can feel something change in the air. Timely words sung at the right moment can bring a wave of comfort and release His faithful presence. “Blessed be Your name when the road’s marked with suffering, when there’s pain in the offering, blessed be Your name.” “Open the eyes of my heart Lord, I want to see you.” “I can only imagine …..I will rise when He calls my name, no more sorrow, no more pain.” These are just a few of the songs that have served the moment and brought hope to those who have lost loved ones. Sometimes we aren’t sure how to bring comfort in situations where someone is fighting an illness or recovering in some way. Often my wife and I have gone to someone’s bedside in the hospital or at their home and simply sang over them. With sensitivity to the moment, we pray for them and ask if they mind if we sing quietly and worship in their room. Some of my most profound moments with God have been during these times as tears flow and faith is released in prayer and song. Scripture is filled with passages that exemplify praise in the midst of pain, promises of joy as we walk through profound sorrow. “Why are you so downcast, oh my soul? Why so disturbed within me? Put your hope in God, for I will yet praise Him, my Savior and my God,” (Ps 42:5-6a). “Even though I walk through the valley of the shadow of death, I will fear no evil, for You are with me; Your rod and Your staff, they comfort me … my cup overflows. Surely goodness and love will follow me all the days of my life, and I will dwell in the house of the Lord forever.” (Ps 23). Lord, give us all that same heart as we seek to console others in their time of mourning. For one day we will wish for someone to sing over us and help us to worship in the midst of our sorrow. This article appeared in Worship Leader Magazine. They were putting together a list of people to invite to a dinner party. She threw out the name of a particular couple and he frowned at her. Unfortunately, we don’t all do a good job of getting over it. This post is from Mark D. Roberts, and appeared today at High Calling Blogs as How Can We Stop Nursing an Ancient Grudge? Ezekiel 35 is a word of judgment against “Mt. Seir,” a geographic representation of Edom. In this chapter, the Lord judges the Edomites because they took advantage of the Israelites when they were being invaded by the Babylonians. The people of Edom even “exalted” themselves against the Lord and spoke against him (35:13). Edom’s reaction to Israel’s plight reflected longstanding enmity between the two nations. In fact, the Lord identifies the source of Edom’s action in this way: “Because you nursed an ancient grudge, you handed the Israelites over to the sword in the time of their distress, during their final punishment” (35:5). The Hebrew of the beginning of this verse reads literally, “Because you had everlasting hatred [’evat ‘olam] . . . .” This is the same phrase that appears in Ezekiel 25:15, where it refers to the “old hatreds” of the Philistines. The “ancient grudge” of the Edomites was similar to the “old hatreds” of the Philistines. Both peoples let old rivalries and animosity govern their behavior, leading them to oppose not just Israel, but also the Lord. This happens as we take to heart the merciful forgiveness God has given us. In Ephesians 4:31-32 we read: “Put aside all bitterness, losing your temper, anger, shouting, and slander, along with every other evil. Be kind, compassionate, and forgiving to each other, in the same way God forgave you in Christ.” We are able to put aside all bitterness and forgive others when we take seriously the way God has forgiven us in Christ. We will stop nursing grudges when we allow our hearts and minds to be transformed by the forgiving grace of God.